One Size Fits All. Once blocked it will measure 49”/124.5cm across the top edge. 42”/107cm from top edge to bottom point. Karen Pimblett is our guest designer from across the Pond! 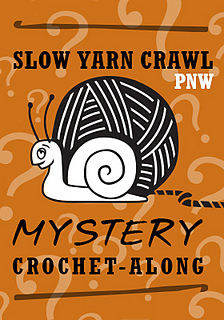 We are so excited to welcome Karen to the Slow Yarn Crawl family and hope you’ll enjoy the clues she has put together for her Under Different Skies Shawl. Let’s get hooking on Clue One! Size: One Size Fits All. Once blocked it will measure 49”/124.5cm across the top edge. 42”/107cm from top edge to bottom point.